After the second of two public hearings, Portland City Council is poised to set a historic national precedent by halting the expansion of fossil fuel infrastructure and prohibiting new fossil fuel terminals as well as expansions of existing facilities within Portland. At Wednesday’s hearing, Council members voted 3-0 on amendments that further restrict fossil fuel infrastructure. While the final vote is scheduled for December 8, the Council made its intentions clear today: the fossil fuel industry will not grow in the City of Portland. The vote was met with a standing ovation from enthusiastic community members who were instrumental in shaping this proposal over the last year. 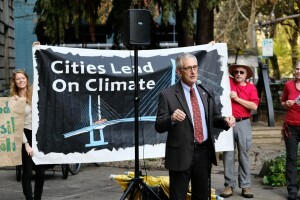 Portland Mayor Charlie Hales speaks to the crowd at the pre-hearing rally outside Portland City Hall on November 10th. Photo by Dragon. The City’s intent is clear—to use the City’s policy to hasten a transition away from dirty, dangerous fossil fuels. On November 10th at Portland’s City Council hearing, hundreds attended and urged bold action on the part of the Mayor and Commissioners. Mosier Mayor Arlene Burns, tribal representatives, and others most at risk from dangerous oil trains testified in support of proposed code amendments. Impressive testimony given by young students opened and closed the public comment period. Council members listened carefully and responded with clear improvements to the proposed zoning amendments. Prevent all new coal storage capacity (there are currently no coal export facilities in the City of Portland). Notably, Portland’s Planning and Sustainability Commission and Portland’s City Council declined to exempt certain fossil fuel companies such as NW Natural, or weaken the ordinance at the request of oil terminal operator Kinder Morgan.